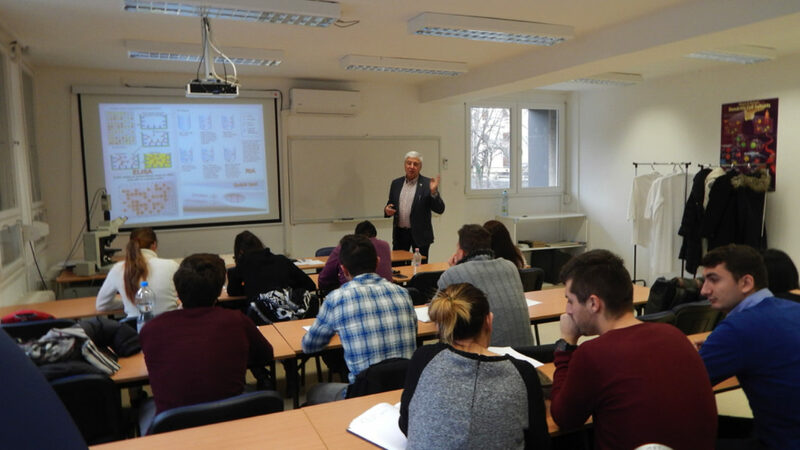 Methodical course on laboratory immunetechniques in molecular biology research was organized by the University of Pécs, Medical School, Clinical Centre, Department of Immunology and Biotechnology between 11 – 15 December 2017. (Course code: OPEL_B-139_NEP1) Selected topics were organized in work packages. Theoretical lectures held by professionals of the Department introduced each work package and followed in own-hand laboratory trainings assisted by experts of the Department. The examination was performed in written test form. The accomplishment of course was equal to 6 ECTS credits. Antibody labelling for practical applications. Immunocytochemistry, immunohistochemistry, fluorescent microscopy, confocal microscopy. Molecular DNA techniques and their immunologic applications I.
Phage display and its applications in immunology. Significance of cell surface CD markers. Flow cytometry. Cell surface and intracellular staining for flow cytometry. New possibilities in flow cytometry. Molecular DNA techniques and their immunologic applications II. This webpage has been produced with the financial assistance of the European Union. The content of the webpage is the sole responsibility of the Josip Juraj Strossmayer University of Osijek and University of Pecs, and can under no circumstances be regarded as reflecting the position of the European Union and/or the Managing Authority.